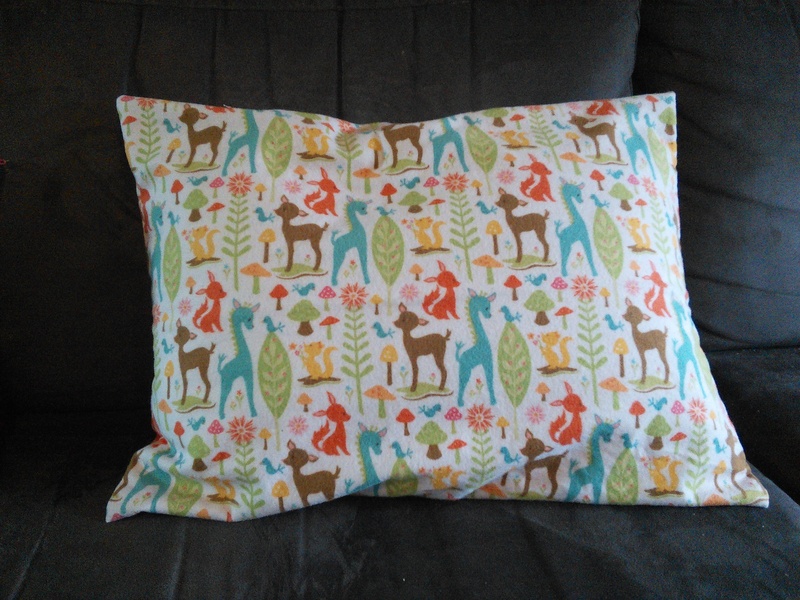 Snuggly flannel cushion covers – Mumma, Did You Know? I decided to make new covers for cushions that I already had. I was given two cushions with covers on them that are a bit scratchy and not great for lounging against, so I decided to make covers. I was choosing between two favourite pieces of material and decided that I had just enough to make the covers out of this piece of soft snuggly flannel. (Riley Blake Designs, Woodland Tales ordered from Hawthorne Threads). When I last did a fabric order from Hawthorne Threads, I just missed out on getting this fabric with a blue background, but went ahead and ordered it in pink anyway because I thought it was so adorable. So I’m happy to be able to put it to good use where I can see it every day. They are sewn with an horizontal opening at the back because that’s the way the material seemed to fit best. If I didn’t have a baby around who likes to chew on everything, I’d add some buttons to the back to make the opening a bit nicer, but instead I’ll just keep tucking the opening closed. I also finished off the edges nicely, which isn’t something that I usually do, but I thought that I might really love these and want to wash them lots and keep them forever. And then I thought that these might be something that my little boy remembers from his childhood when he’s bigger and got a bit sentimental. Said baby loves to cuddle these and now often climbs on to the couch and snuggles up with one of the cushions, so that’s a definite tick of approval from him.